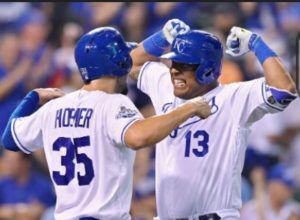 Salvador Perez followed a single by Eric Hosmer with a two-run homer to give the Royals a 3-2 victory over the Cleveland Indians on Tuesday night. The Royals are a streaky team. After winning six in a row, they dropped eight, and now have put together four wins in a row. Joakim Soria (3-2) pitched a scoreless eighth inning and then handled the ninth with setup men Luke Hochevar Kelvin Herrera and closer Wade Davis unavailable. Soria got Jason Kipnis to pop out with runners on first and second to finish off the win. Rookie Whit Merrifield homered for the second straight game.